Authorities are asking for help from the public as they investigate a fire that seriously damaged a camper last Friday (Sept. 21) in Olivia. The Olivia Police and Fire departments were called that afternoon to the 2700 block of Lincoln Avenue West, where the fire had previously occurred. Authorities say the camper sustained significant fire damage to the interior, and officials determined the fire had been intentionally set sometime during the week. The Police and Fire Departments, Renville County Sheriff’s Office, and the state fire marshal continue to investigate and are asking for the public’s assistance. A reward is being offered for information leading to the identification of the person or persons responsible. 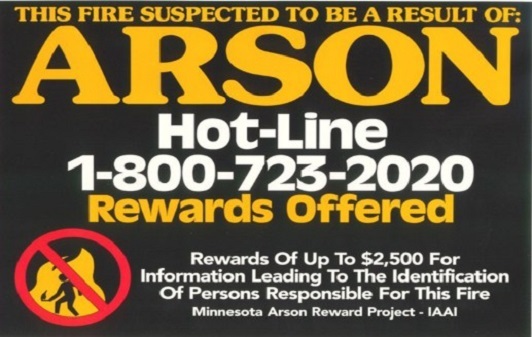 Tips can be submitted online (click here) or by calling the Arson Hotline at 1-800-723-2020 or the Olivia Police Department at 320-523-2700. Tips may remain anonymous if requested.